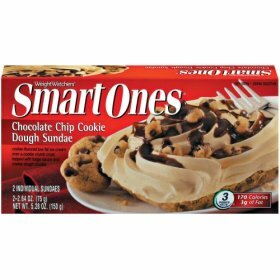 The Smart Ones Chocolate Chip Cookie Dough Sundae is in the freezer section of your local grocery store in the traditional red "Smart Ones" packaging. There are two servings in the box, each one weighing in at 75 grams. As the box says, the sundae combines "low-fat cookie-flavored ice cream over a crumbly cookie crust topped with fudge sauce and cookie dough crumbles." That sounds tempting enough. I am always looking for a good low calorie and/or low fat desert when I am looking to burn fat, and these were on sale at the local grocery, so I took a chance. At 170 calories, my expectations were not all that high. I generally expect my deserts to be dripping with calories… I mean, really, how good could it be at only 170 calories? And if it was good, how big could it really be? Would it be enough to satisfy me? Or just big enough to leave me wanting more? Fortunately, I wouldn't have to wait long to find out. Preparation time is a mere 10 seconds. Appearance wise, the Smart Ones Chocolate Chip Cookie Dough Sundae is nothing to write home about and looks nothing like the picture on the box. It is kind of smooshed into a the cellophane covered "low fat black" container (want to know if you are eating diet food, look for the black tray! :) ). The taste, however, was absolutely, unequivocally amazing. I found myself audibly going "Mmmmm." There was nothing in any bite that said low fat. The cookie dough crust was moist, and the cookie crumbles big enough to be tasted in every bite. The best compliemnt I can give the Smart Ones Chocolate Chip Cookie Sundae is this - it was so good, in fact, that I went back to the grocery store the next day to buy a few more boxes! Looking at the desert from a "will it help me to burn fat" standpoint, it is low in calories (170) and low in fat with only 3 grams (1.5 grams saturated, 1 gram monounsaturated). There are 32 grams of carbohydrates with only 1 gram of fiber, so this is definitely not for the low carb crowd. The protein is low at only 3 grams. The only complaints I have is that 10 seconds (the box recommends 5) is not enough time in the microwave to get the fudge sauce going, and any longer makes the ice cream runny. Additionally, the serving size is on the small side, but not so small that I am running to the freezer to get another one. The taste is what makes me do that! If you are looking for a change up your desert from the mini Breyer's 100 Calorie Pack ice cream, this is an excellent alternative, and more filling as well! Definitely a must try for Middle Managers™ on a low fat/low calorie style fat burning weight loss program. This website have big collection different kinds of music and groups music as well. So many world's most famous songs i found in this website which is a proof of your interest with this site. I like to download some songs in this site and share with my closest friends. At this time, I want to get essays online but this site contain a lot of website regarding muscle building and burn fat as well. This was quite possibly the most disgusting thing I've ever bought. I checked the expiration date-a whole month after the date of purchase. I opened one as soon as I got home, eagerly anticipating the sundae pictured on the box. Imagine my surprise to find a soupy mess of white bubbles, chunks of brown goo, and water swirling around the bottom. I tried one anyone to find ice chips, a soup of water and vanilla flavoring. I immediatly threw both away. This is not worth it at all.